Henry Mintzberg, an esteemed Canadian expert on business and management, as well as the Cleghorn Professor of Management Studies at the Desautels Faculty of Management of McGill University, has pointed out that an inherent weakness of traditional strategic planning is that it can’t mirror strategic thinking. Planning tends to be linear, while creative activities or “connecting the dots” (as Mintzberg calls it) are not. You can understand this concept by looking at the simplest of project management tools, a to-do list of tasks. Even if the list captures all required activities, it’s static; it doesn’t allow you to visualize how various tasks will be completed in tandem or consecutively; their interdependencies; or how efficiencies could be built into the process. As such, strategic planning templates such as project mapping have evolved beyond linear lines of thinking to capture the multi-dimensional complexity and innovative potential of projects. Interestingly, this is due as much to human biology and evolution as it to the template design. Recent research has shown the human brain is hardwired to plan, learn and create through visualization. When you can visualize different aspects of a project, different parts of your brain are stimulated – meaning you not only see the project more clearly, you can actually think better. A strategic plan enables you to show how your project supports the company vision and objectives, making it easier to get buy-on at the executive level and collaboration from other teams. A strategic plan identifies internal and external threats and opportunities upfront, so you can make more proactive decisions to help to keep your project on time and on budget. With smarter decision-making, a project founded on a strategic plan is more likely to be innovative, get to market faster, and enjoy higher sales and profitability. A strategic plan is a rallying force that lets everyone see the big picture, leading to increased employee engagement. Strategic planning puts your company in a forward-looking position, making your project and your organization more resilient to downturns in the economy and your industry, as well as better prepared to pursue opportunities. Want to learn more about visualization and strategic planning? 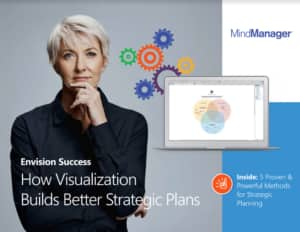 If you’re intrigued by the the role visualization and strategic planning plays in project success, and you want to learn more, then you may be interested in our free eBook titled Envision Success: How Visualization Builds Better Strategic Plans. In it, you’ll learn 5 proven and powerful methods for strategic planning that lead to success.